New Year, New Desk - i like comics too! Hey, you. It’s been a while. 2016 was an eventful year. I got a promotion at work, moved away from home and into a new place with my long-distance boyfriend of several years and– and!– adopted a cat. Blogging took a back seat to adulting. But now that life’s (mostly) settled, let’s bump blogging back up in the priority list. Many of you have followed my adventures in customizing vinyl figures, which I’m diving back into during 2017 with a brand new workspace. Let’s go over my setup in case some of it might be useful to you! The left side of my Micke desk contains: a cat mug-turned-planter from Fishs Eddy, two trays from Poppin, a wireless mouse, an old Nintendo 3DS (to be customized), a hexagonal coaster, a Muji acrylic stand (discontinued), my paints (the smaller are Citadel, the larger are Americana) with pink soap (to clean brushes) and Flow-Aid, a mixing tray, a clear pad to protect my desk from paint spills (acrylic paint scratches right off the surface) and a cutting mat. The right side of my desk contains: My Little Cthulhu DIY that I’m customizing, an Adam JK Feelings jar I use to store my brushes, a Mason jar for paint water, an anatomy figure, a Poppin lamp, Muji acrylic drawers and two ceramic knick-knacks– a bowl and an Adam JK trophy. The two extra-wide drawers were organized with some dollar foam board that I measured and cut into interlocking dividers. On the left side is my stationary and sculpting supplies, including my dremel and Super Sculpey. 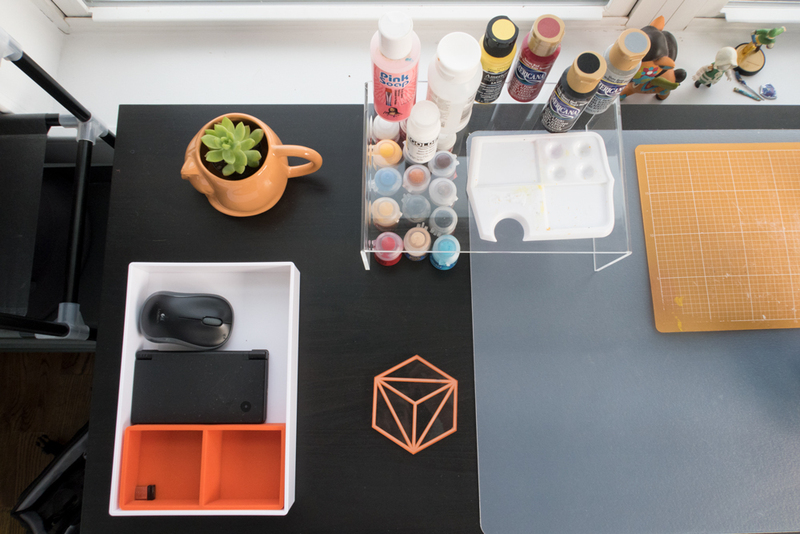 On the right is my painting and coloring supplies, including acrylic paint markers, another mat and a palette that keeps mixed paint wet for weeks. You can find a full list of everything I use to customize figures here. 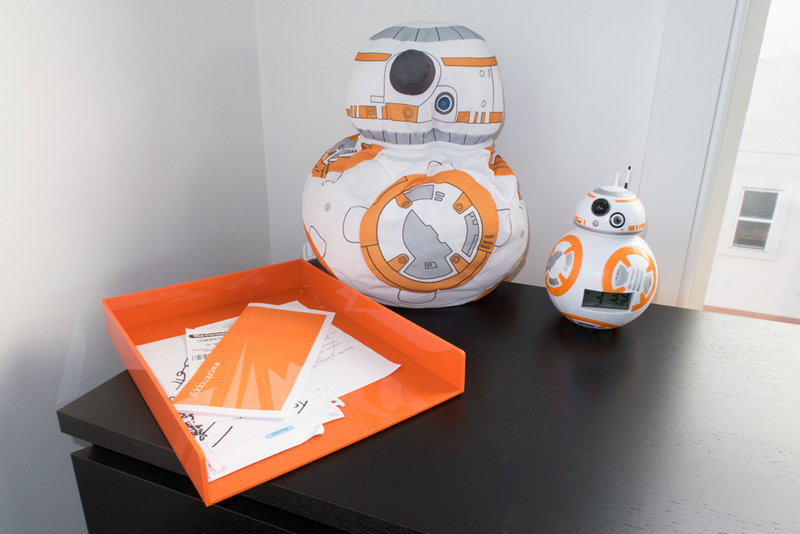 Two little droid pals protect the important paperwork on my dresser, which sits in another Poppin tray. 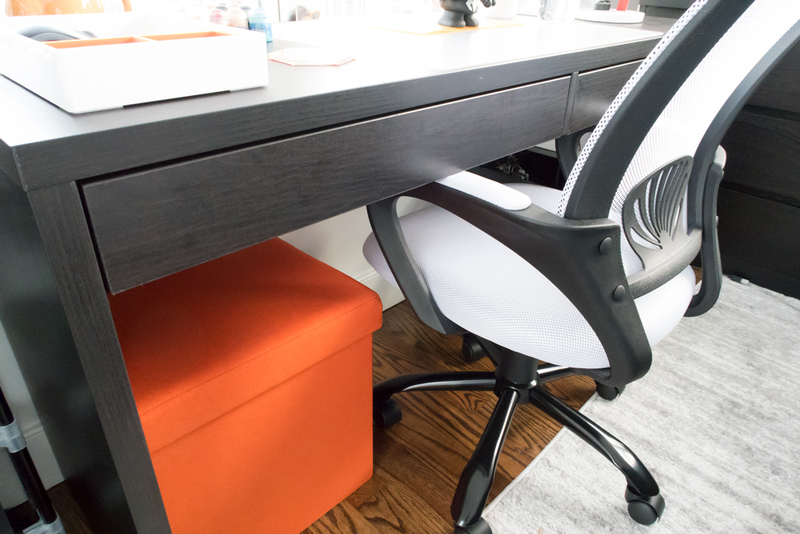 Finally, peeking out from beneath my desk is yet another Poppin accessory– a stool! This not only serves as an extra seat but also as storage. Right now it houses my blank Pop figures for customization along with some other odds and ends. It’s soooooo neat! My area is the opposite. I’m a complete savage.